Is this something to do with one of those Ringways? No, it's not. Well, maybe. Sort of. Perhaps. Oi! This isn't an episode of Doctor Who! Anyway to the point. The need for improvements to the road network in London have been recognised for a long time, with various Commissions and Reports on the subject throughout the twentieth century. There was the Royal Commission on London Traffic in 1905, the General Road Plan in 1913 and the Highway Development Survey of 1937. Each of these proposed various improvements to the London road network, but in most cases only small parts were built. Just as in more recent times, where improvements were made, they weren't all made to the planned standard. Then came World War II, and in the midst of it all, Sir Patrick Abercrombie. In 1943, he (along with JH Forshaw) wrote the County of London Plan. He was at it again in the following year, and wrote the Greater London Plan. These plans dealt with the post-war regeneration of the city and its surrounding areas, covering not only the road and rail networks, but also such elements as industry and housing. These were all put together in a comprehensive plan, containing a collection of Rings, Radials and Parkways. Abercrombie thought long and hard about the naming of these, and came up with such gems as "Radial Route 7" (which later became known as M12). 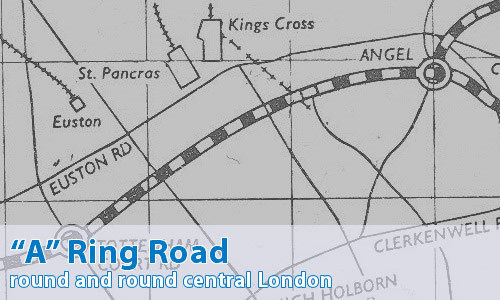 E Ring - a sub-arterial route, which was designed as a jaunt around the Home Counties, with picnic areas and the like - and with changes became Ringway 4, or the North and South Orbital Roads. Today, we know most of this as the M25. D Ring - an arterial route, designed to be the major route around London - which turned into the M16 Ringway 3, or nowadays the section of M25 between South Mimms, Darford and the A2. C Ring - another sub-arterial route, whose modern equivalent is the A406 North Circular Road (nee M15 Ringway 2) and its completely missing southern equivalent. B Ring - the main ring road around central London, which after much mucking about ended up as Ringway 1, parts of which being the M41 and both sections of A102(M). A Ring - a sub-arterial route around the main commercial sections of the City and the West End. As well as that, he came up with two arterial routes crossing central London - the snappily titled "Route X" and "Route Y". Route X would have crossed the central area in a north-south direction from Swiss Cottage in the north to Elephant & Castle in the south, via Waterloo Bridge. Route Y (perhaps not all that surprisingly) would have gone west-east from Limehouse to Battersea Bridge. Hang about a second. You said "sub-arterial". Up there you said that wasn't a motorway! Indeed I did - glad to see you're paying attention. Probably not - but you get to be grumpy regularly. It's my turn today. Anyway, I'll continue the story, shall I? When the war ended, London was in ruins. Whilst that may seem like a planners' utopia, the reality was somewhat different. There was such a huge need to rebuild homes and industry that the inner area of the Plan was quietly set aside, and things were done wherever they could, however they could. There wasn't the money to go around, and so the grand design never really saw the light of day. In 1948, a Joint Technical Committee of the London County Council and the Ministry of Transport was formed in order to look at the central area proposals. So, the planners of the time took Abercrombie's plans, sharpened their pencils and got drawing. The Committee reported back, and decided to swap the functions of the A Ring and the B Ring - meaning that the B Ring was to become sub-arterial, and the A Ring was to become an arterial road, or urban motorway. At the same time the route of the A Ring was altered, and the number of junctions reduced. The theory went that if the A Ring was upgraded to motorway, then the even more ridiculously expensive Route X and Route Y that crossed the central area could be deleted from the grand masterplan. Another large problem can be seen with the benefit of hindsight. If the A Ring was to be the main motorway Inner Ring Road for London, then all of the major radial routes would need to be brought that far into London. There were serious plans to bring the M1 all the way in to Montagu Square, along with what would become the M11 terminating at the Angel, Islington. By 1950 it was estimated to cost £88 million, and by 1956 the estimate had risen to £130 million. Whilst this looks like a huge rise in costs, given the rate of inflation since the initial 1948 estimates, it's actually only a slight rise in real terms. Perhaps not surprisingly, for a nation that still had ration books, this cost was too much to bear. However, the actual timeline of the killing off of the A Ring is currently still somewhat mysterious. According to some sources, it was cancelled by the Government in 1950, yet it turns up in the Conference on Urban Motorways in 1956, and circumstantial evidence suggests that it may have been in the thoughts of the planners as late as December 1959 - where evidence shows the M1 still being listed as having its southern terminus in the Marble Arch area. What is certain is that it isn't mentioned in either the 1951 Development Plan for the County of London, or the 1959 Committee on London Roads reports. Phew! That's quite some story! It certainly is - and looking at the situation there today, it seems astonishing that such a motorway was ever considered in central London. So what route would it have taken? Let me show you a 1956 map, or alternatively the relevant Might Have Been Map page. Thanks to Chris Marshall and Jonathan Winkler for their assistance with this feature.